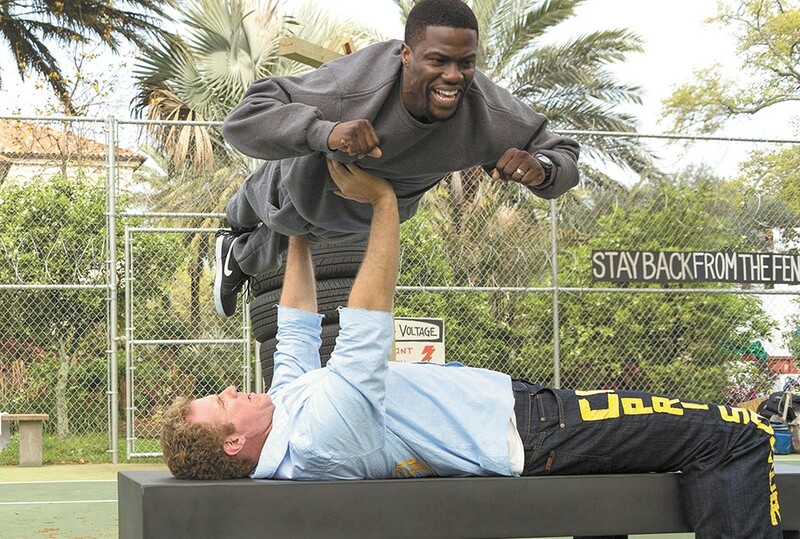 Will Ferrell and Kevin Hart trying to be funny in a mostly unfunny film. You've got to wonder how Will Ferrell makes career choices. There have been great roles, ones that he's absolutely owned: in Zoolander, Elf, Anchorman, Talladega Nights, The LEGO Movie. And there have been clunkers: Bewitched, Blades of Glory, Land of the Lost. Unfortunately, Get Hard fits uncomfortably in that second group. Ferrell plays James, a wealthy, spoiled, selfish fellow who lives in a huge home and has a beautiful, if demanding, fiancée. He's very good at what he does in the world of fund management, something to do with statistical analysis. But he exists in a sort of protective shell that keeps him in the dark about the ways of the world. He looks down upon anyone below him, and is an obvious racist. He has no idea that some of the things he casually blurts out would, to most people, come across as demeaning. All he knows is that he deserves the partnership that was just offered to him, even if it likely won't make him any happier. There's also Darnell (Kevin Hart), one of those people that James unwittingly demeans, and his exact opposite. He's a hard-working and very happy family man, owner of a car wash and hoping to get a bank loan in order to move his wife and daughter to a better part of town, specifically to get his daughter into a better and safer school. Soon enough, the clueless guy in tony Bel Air is going to need the help of the sweet guy in South Central. In the midst of his engagement party, James is cuffed, led away, and informed that he's headed for San Quentin on all sorts of fraud and embezzlement charges. But he's given 30 days to "put your affairs in order." The tacky script makes it blatantly obvious that he's innocent (and just as obvious about who the real culprit is). But rather than try to clear himself, James' solution is to contact the only black man he knows: Darnell, who's been washing his car for a couple of years. After all, statistics, at least those in James' head, say that most black men have done time, so Darnell should be able to help him survive in prison. Let's see: Darnell has never even had a parking ticket, but he needs money for his family; James has plenty of money; James, in Darnell's eyes, is a moron. A deal is made. Darnell, with the aid of a Google search, will tutor James in how not to get raped in prison. And so begins the main story line of a movie that grows more embarrassing to watch as it ticks along. There are "training sessions" to toughen up James, but they go on too long, and Hart, though he's good with physical humor, wears out his welcome due to the repetition of lines that are funny once or twice, but not three or four times. His best moments are the stunned reactions on his face when he sees and hears what's coming from the eager-to-learn but still idiotic James. There are pieces of good slapstick, and it's hard not to laugh at the size difference between the two leads when they're next to each other. But the film could easily have had entire sequences removed (the unfunny Alliance of Whites scene being one of them) and come out more palatable. Get Hard is not showing in any theaters in the area.